“My son loved to eat Gerber Puffs,” says Michelle Hephner, DO, a mom of two daughters and a family physician in private practice with Central DuPage Physician Group, in Winfield, IL. 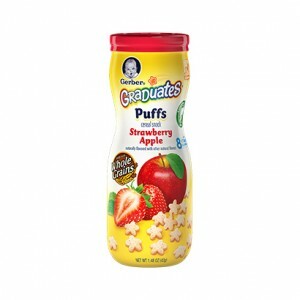 “Puffs are great because they allow for hand-eye coordination, are easy for kids to grasp, and melt in the mouth. You can buy Gerber Puffs in stores and online for around $3 a canister. Visit Gerber.com for more information.